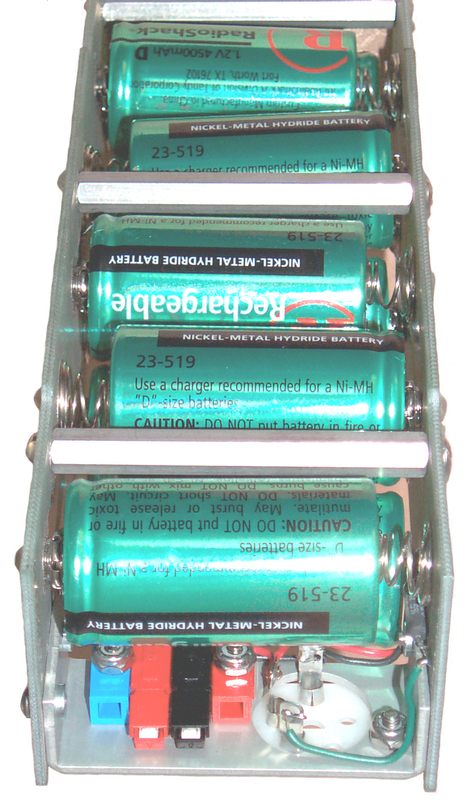 The 257477BA is a Battery Adapter that replaces the BA-4386 or BA-5598 in all applications where the CY-2562/PRC-25 battery box is used, such as the PRC-25, PRC-77, PRC-124, PRC-1077, PRC-1099. GRA-114, military radios. 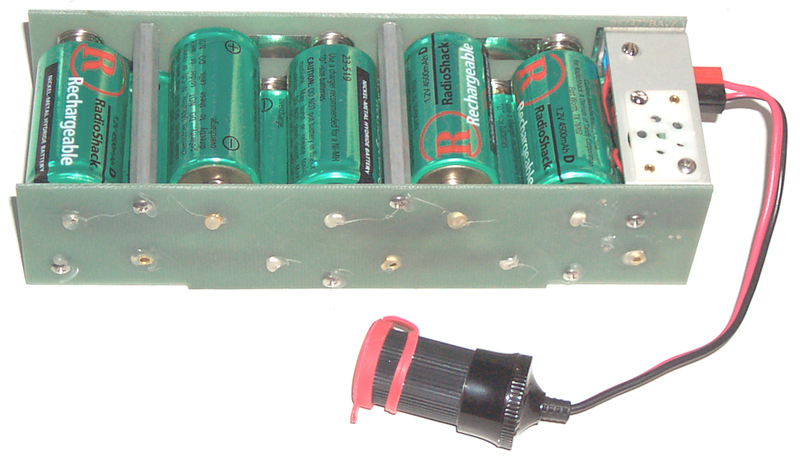 It also works in some applications where another battery box is used such as the PRC-74 with the CY-6314 battery box (but not the "A" version) plus the USQ-42 and USQ-46. The KY-65, PPS-115, PPS-115A, PRD-10, PRD-12, URR-69, USA-32, URC-100 have not been tested, they might work and might not. This battery adapter holds 10 each common "D" flashlight batteries. The batteries can be Alkaline to provide the longest talk time, Ni-Cad or Ni-MH rechargeable for lower life cycle cost. There are some plastic battery adapters on the used market that hold 10 "D" cells, but it's done using 3 strings of 3 cells and a lone single cell. These adapters can NOT be used with the PRC-25 since they can not supply the needed 3 Volts. This version of the 257477BA is a plug and play solution, no modifications of the radio or battery box are required as was the case with prior versions. The -PP option adds a pair of Anderson Power Products PP15 "Power Pole" connectors. The orientation of the Positive and Negative connectors is the one standardized by ARES. 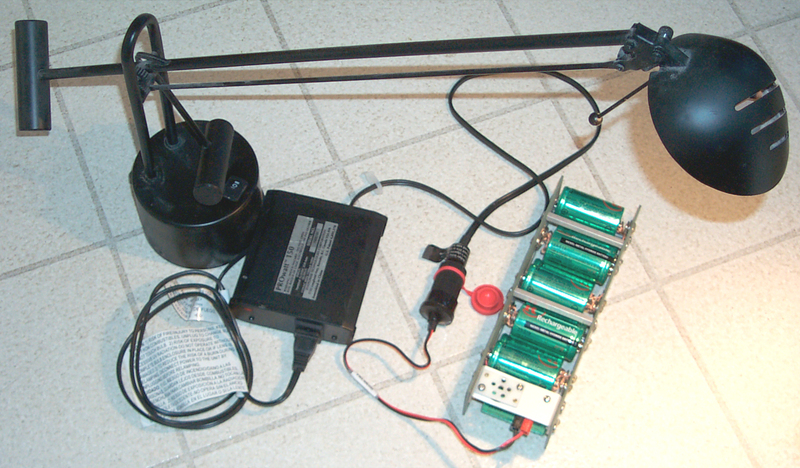 This allows this battery adapter to be used to power equipment that runs on 10 to 15 Volts DC. For more about vehicle voltages see "What's a 12 Volt battery". I recently wanted to power a GPS receiver for 24 hours continuously that needed 9 to 32 Volts and it's internal battery would only last 6 hours. So I soldered a cigarette lighter socket to one the 257477BA V7.2 Battery Adapters. This worked great. The photo on the left is shown with the Positive connector on the left to match the way it shown on the orientation web page. Some Battery options and weights including $/Watt Hour. Showing the 257477BA with the PPCL Cable installed. You can see that when the PPCL cable is unplugged the 257477BA can be used the same as one without the -PP option. The Red Cap on the cigarette lighter socket is to keep it clean and to keep keep out coins or other stuff that could cause a short. Note there is no fuse in the 257477BA. The optional PP-CLS cable has a Power Pole plug on one end and a Cigarette Lighter Socket on the other end. It's commonly used with the -PP option on the above battery adapter, but can be used in any Power Pole system where you want a Cigarette Lighter Socket. For those who already have one of my 2577BA or 257477BA battery adapters there are a couple of adapter cables. Note that the following two cables can be used with my adapter or with an actual battery like a BB-5598, BA-4386, or other PRC-77/PRC-25 battery to get to Power Pole or Cigarette Lighter connections. 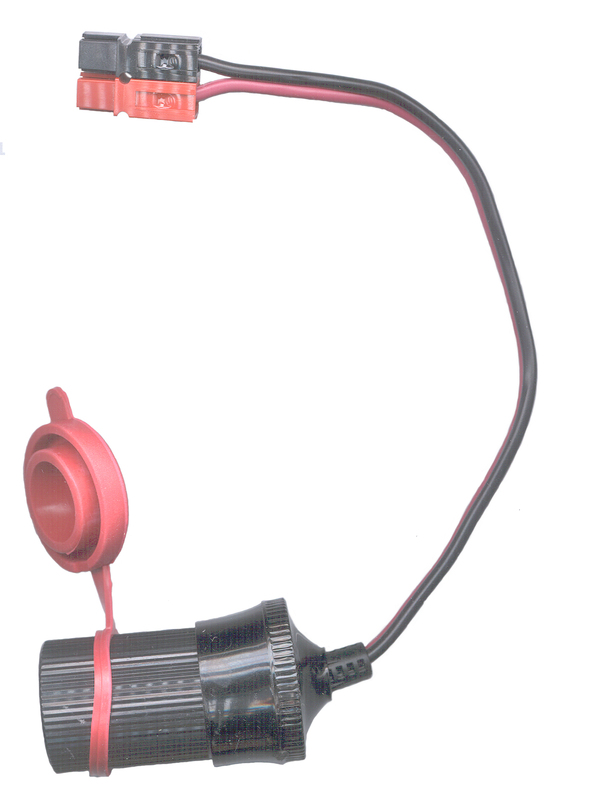 The Optional 25-PP is a short cable with a PRC-25 Battery Plug on one end and a Power Pole connector pair on the other end. Can be used in any of the PRC-25 type battery adapters and on actual batteries like the BA-5598 or any of the mil batteries that can power a PRC-25 or PRC-77. Can also be used for charging the battery. Use the PP-CLS cable above to get to Cigarette Lighter socket. Has table showing resistance of complete 257477BA-PP with various types of "D" cells installed. This allows predicting the output voltage given the load current. The 257477BA has the following improvements to the 2577BA. The 2577BA will still be offered since it has a lower price and works in the PRC-25 and PRC-77. But the 2577BA requires removing the foam strips from the battery box. 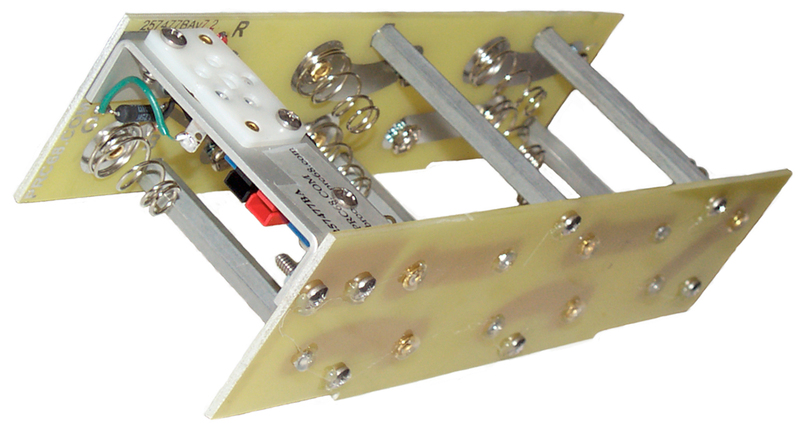 This version uses a pair of 0.093" thick G10 fiberglass printed circuit boards for the plates instead of the plastic used on the standard 257477BA (Version 6.5). The fiberglass is much stronger than the plastic used for the prior versions. Printed circuit traces replace all of the between battery connections. 6 Sep. 2003 - Using an Electronic Load controlled by a computer a load test was run using 10 each RS 23-519 Ni-MH "D" cells rated at 4.5 AH. The battery pack lasted 30 hours with a receive load of 0.05 Amps for 9 minutes and a transmit load of 1.1 Amps for 1 minute, repeated until the voltage goes below 10 Volts. These are the loads from a PRC-25 on the 15 Volt section. This is about 4.65 AH from batteries rated for 4.5 AH and that have only had a small number of discharge - charge cycles. 11 Sep confirmed that you get 30 hours from 10 each 4.5 AH Ni-MH batteries. Charging these batteries took 6.64 AH. It's typical that you need to put more charge into a battery than you take out of it. The efficiency of these batteries is 4.65/6.64 or about 70%. Note that 9 AH Ni-MH batteries are available and they should last twice as long, or about 60 hours. PRC-25, PRC-74 only with the CY-6314 battery box, PRC-77, PSN-6 Loran-C receiver, TS-2963/USQ-46 (the 80718-3 1A3 battery box will only go on one way) so the USQ-42 and USQ-46 should also work. The PRC-124 = PRC-1088 should work because it uses the same battery box. PRC-1077 reported to work fine. PRC-1099 uses the CY-2562 so will work. RT-1185/GRA-114 Receiver-Transmitter uses the CY-2562 so will work. 21 March 2014 - Modification using as wide copper braid that will fit spring. 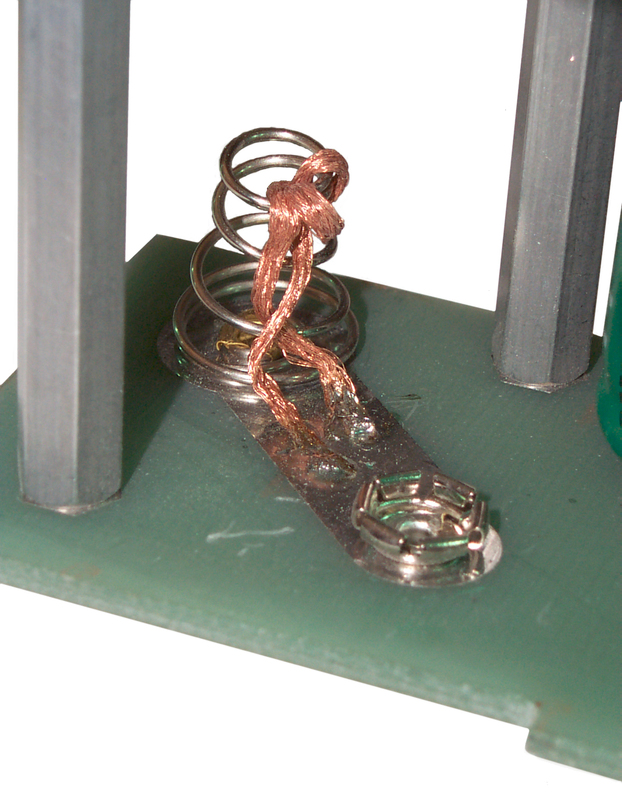 Internal Resistance of adapter loaded with 10 each D cells to follow and a comparison with stock and prototype narrow copper braid adapter shown below. The prototype measures just over 5 Ohms internal resistance when loaded with 10 each 8500 mAh cells. Loading the March 2014 adapter with the wider copper straps with the same batteries shows an internal resistance of 0.040 Ohms. While loading the same batteries back into the prototype it was discovered that a couple of the male battery contacts had their fingers spread open and were not grabbing the positive terminals as they should. These were bent back using a small screw driver and the internal resistance remeasured as 0.031 Ohms. Next a stock 257477BA was loaded with the same cells and it measured 0.061 Ohms. So it appears the width of the copper strapping does not make very much difference, but adding it does cut the internal resistance about in half. 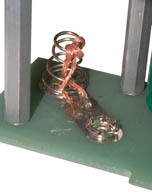 By warping solder wick (copper braid) around the small end of each spring where it contacts the bottom of the battery and soldering both ends to the wide printed circuit trace the spring resistance is paralleled with the copper braid resistance. This lowers the total resistance of the pack and is helpful when currents over 1.5 amp are being drawn. It will not make any noticeable improvement when the adapter is used in a PRC-25 or PRC-77 but will help in radios like the PRC-1099. You might be able to pull 4 amps when Ni-MH cells are used instead of about 2 amps for a stock adapter. Note that although Alkaline cells provide more voltage they are not capable of delivering as high a current as rechargeable cells. An exception may be the Eveready brand that does have lower internal resistance than other Alkaline cells. 25 Nov 2006 - I have received a report that this mod works well in the PRC-1099 when used in the 20 Watt mode. 22 & 23 Sep 2007 - My wife needed to power a cordless phone, credit card verifier and desktop calculator where the AC mains power was out. She used the 257477BA-PP that had been modified for high current use with an inverter and it worked well. Since I don't have the items she was powering for demonstration I've connected a 50 watt desk lamp running on the high position. The inverter acts like a transformer so if the 115 VAC load is 50 watts the draw from the battery pack will be a little more than 50 watts. This inverter is rated to 150 Watts, but I doubt the battery pack will run it at that level. On the first attempt to take this photo the flash did not fire because the light was so bright. The photo you see here was done after putting the camera in Fill Flash mode. Peaks: 5.69 Amps and 69.4 Watts. These are old (couple of years) Radio Shack 23-519 Ni-Cad "D" cells rated at 4.5 Amp Hours. Next charge using the Battery Space Universal charger. Very similar to the first run. Modern cars have "theft proof" radios, GPS, etc. with a blinking LED when the car power is off. The idea is that if a thief removes the radio from the car it senses the loss of primary power and then requires a secret pass code to activate. It can take many hours if this happens to you because your battery went dead (here's how I recovered the code once before). The same problem will happen when you replace a bad battery. Note: A bad battery does not have enough capacity to start the vehicle, but does have enough power to maintain the radio and GPS magic codes. I'm guessing they convert the "12 Volt" supply to 5 Volts and that powers the logic needed, so even a very "dead" battery as far as starting is concerned will still maintain the radio codes. So, If you remove the old "dead" battery you will need to supply the radio magic code. In the case above where I had replaced the part of my Honda that had the radio serial number there was no way to get the radio serial number (needed to get the magic code from the factory) except to take the car apart. The headache associated with getting the code number can be avoided if you supply the car with "12 Volts" while the battery is disconnected. This can easily be done using the 257477BA-PP battery adapter with the Power Pole option and a Cigarette Lighter Plug to Power Pole cable. 1. Try all the Cigarette Lighter Sockets on your car with the key removed to see if any of them are hot. To do that plug the CLP-PP cable into each socket and see if the LED on the CLP turns on. If none of them are hot with the key off then turn the key to the first position like used to listen to the radio with the engine off) and see if the LED now turns on. The key needs to be in a position where the socket you are going to use is "hot" during the battery replacement. 2. Unplug the cable from the vehicle and connect the Power Pole end to the 257477BA-PP and confirm that the LED turns on. If not, put fresh batteries in the battery adapter. 3. Now with the ignition key in a position that makes the socket "hot" use the cable to connect the battery adapter to the vehicle. 4. Replace the vehicle battery. 5. Remove the cable and battery adapter before starting the vehicle. added Aug 14, 2013. Worked on Honda when battery was replaced. The 257477BA has two notches on the bottom to clear the cushions used in the CY-2562/PRC-25 battery box to support a BA-4386/PRC-25 or similar full size battery. But some late model PRC-77 radios used the BA-5598/U half size battery and were fitted with four cushions. The center two cushions are NOT compitible with the 257477BA and need to be removed. If the outer two cushions are not fully in the battery adapter notches they need to be moved. The VPA2577 can be used to power a PRC-25 or PRC-77 by means of the front panel POWER connector. The VPA2577 has Power Pole Connectors on one end and so can be powered from the 257477BA-PP.